It seems like cleaning during the winter months is an uphill battle. Mud and moisture are being constantly brought in on the bottom of little feet. With no place else to go, family members and pets are constantly underfoot. Worst of all, the months of gloom have a way of sapping the will from even the most fastidious hearts. Luckily, it usually only takes a single sunny day for most people to catch spring cleaning fever. It is generally best to start any spring cleaning project by focusing on floors and carpets. Unfortunately, this is no easy task. Cleaning floors is not a quick process. This means that family members or customers have to be kept off of the area for extended periods of time. However, a clean floor can make a world of aesthetic difference. First, remove as many obstructions as possible from the area to be cleaned. Constantly moving around furniture and other fixtures is a hassle. However, constantly cleaning around things means that the space beneath the furniture is going to wear unevenly. There is nothing worse than moving a couch and discovering that the carpet underneath it is three shades lighter than the rest of the room. For carpeted floors, the next step is to remove as much surface dirt and debris as possible through simple vacuuming. Unfortunately, this often means vacuuming the same area more than once. This is annoying but necessary. Once the area has been sufficiently vacuumed, the carpet is ready to be deep cleaned. Often times, this means hiring a company to perform a deep level extraction. Luckily, cleaning floors that have not been carpeted is a slightly easier task. When it comes to hardwood or linoleum in a commercial setting, most of the dirt and debris accumulate on the surface of the material. This makes vacuuming or sweeping a much less involved task. However, using the correct equipment and cleaning supplies can often be an issue. Many surfaces can be permanently damaged if the correct chemicals are not expertly applied. When incorrectly mixed, degreaser and other cleaning supplies can also pose a threat to the cleaning crew. Even the most benign cleaning products can leave behind unsightly residue when not removed correctly. Additionally, many people lack the knowledge and experience necessary to safely use an industrial scrubbing machine. In most cases, a mop and bucket are just not up to the task. Based on these issues, many people simply opt for professional cleaning services. 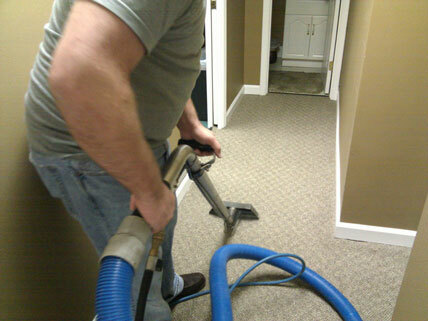 Call Renew Carpet Care for all your Pittsburgh professional carpet cleaning needs.